The KDEP is funded by grants from various federal agencies, such as the Environmental Protection Agency (EPA). Because most of our funding comes from EPA, the majority of projects we undertake benefit the community as a whole. 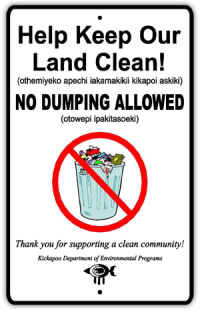 Community-wide projects include surface water monitoring, providing roll-offs for annual community cleanup events, and educational opportunities for children. We also offer indoor air assessments and radon testing to individuals, and provide information on a variety of environmental topics including testing and disinfecting residential wells, proper handling and disposal of pesticides, water conservation, and indoor air quality. Due to funding constraints, there are some services our department is unable to provide. Please contact our office for information on environmental topics or with environmental complaints or concerns.